Inside: Don’t be overcome by anxiety! 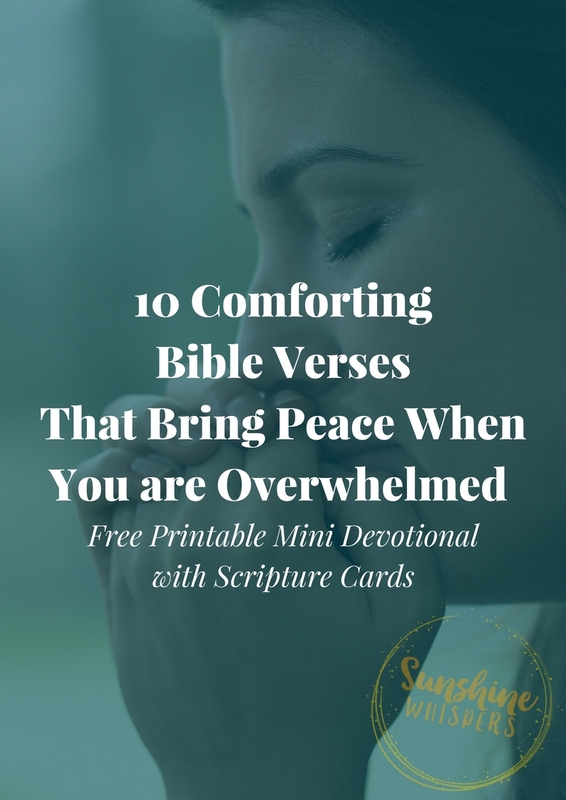 These 10 Comforting Bible Verses For When You Are Feeling Overwhelmed are perfect for reminding you God is in control and He can bring you peace. FREE Devotional and Printable Scripture Cards too! Sometimes being a Mom can be super overwhelming. Of course, if you are a Mom, you are likely nodding your head in agreement with me. There are too many things to do, so many needs to be met, and a dwindling supply of energy and inner peace. Thankfully, God knows us better than we know ourselves. These 10 scriptures won’t cook dinner for you, but they will definitely help you keep your perspective straight, your mind set on things eternal. Because seriously, regardless of the chaos swirling in your life right now, it is so comforting to know that God is in control. God has got this and God will take care of you. Being reminded of the eternal perspective really helps me focus on the fact that this world is not my home. Overcoming Overwhelm Mini Devotional and FREE Printable Scripture Cards! Guess what? Because I really need to let God take control of my own feelings of overwhelm, I created a short devotional centered around these 10 verses and I really would love for you to have access to it, for FREE! Just click the photo below to sign up for the free printable PDF and weekly encouragement. The first page is this super pretty poster you can print out and hang on your refrigerator or your wall at work (in case you need the reminders there). The next few pages are simple scripture cards you can print and cut out to bring with you wherever you need them (desk, bathroom mirror, purse, as a bookmark even?). The rest of this downloadable PDF includes 10 printable pages that you print out and can fill out yourself, one page for each scripture. Each day there is a place to write the scripture, reflect on how you can apply it to your life, and then write out a prayer for the day.